You are facing a lot of things right now. You have a lot on your plate. I know I do. I have relationships that give me trouble, trying to be successful at work, I have struggles with my health and the health of others all while trying to glorify the Lord and in general get my act together. We definitely all face our troubles. Ever feel like you’re banging your head against the wall? As I sit here writing this, I hear the crazy robin in our backyard. He keeps flying into our window. I think he’s eating fermented berries off our tree, sees his reflection in the window and picks a fight with himself. He’s been banging his head against the window so hard it now has blood all over it. I think sometimes we’re like this dumb bird (drunk or not). We see something that looks like a problem, and we try to fix it ourselves, but all we seem to do is keep hitting our head against the wall. Sometimes I think we even truly hurt ourselves, maybe even with some permanent damage. Trying to help, I’ve put our ladder in front of the window. Hopefully that will at least help him to know this isn’t the way to handle this problem. Feel like you’ve been raked over the coals or fed to the lions? Don’t worry, no matter what you’re going through, God can rescue you. He will save you. We may try everything we can think of to fix a situation. We may think that there is no other way it can be fixed, but that’s only because we’re looking at human ways to fix things. God has his own ways. 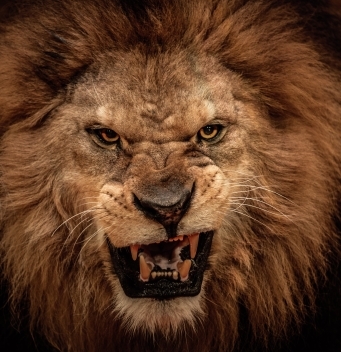 Ways that defy the normal laws of nature: Fire burns people or Lions eat meat when they’re hungry. These things didn’t work the way they usually do, because God is bigger than those problems, and He’s bigger than our problems too. Whatever you’re going through, whatever is weighing heavy on your heart, let God take care of it, because He can handle anything that’s going on in our lives. We can trust Him to care for us like He did Daniel, Shadrach, Meshach and Abednego. Are you being raked over the coals?